For me, this is the perfect blondie recipe. Won't ever try another one. There's nothing new or different about it, but I love it because 1) it works, 2) it is almost too easy (waaay easier than chocolate brownies), and 3) it makes moist, dense, bordering on under-baked blondies that are better than the ones at the Boston College dining hall circa 2001 that used to haunt my dreams. As far as I'm concerned, all the credit for this recipe goes to Anna at Cookie Madness, who is apparently my patron saint of desserts. When I decided to bake, I read SO MANY recipes before ultimately choosing one. It takes up a lot of my time...it's sort of a problem. 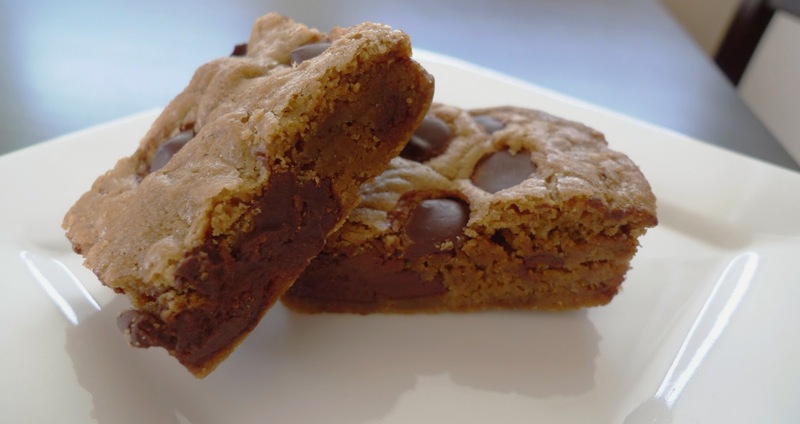 I always check out the huge Cookie Madness archive and frequently end up using one of the recipes. I'm afraid I don't know who Katy (see below) is, but she rocks!!! Good chocolate is key! I used Ghiradelli bittersweet (60%) baking chips. I don't think leaving out the rum would be be a problem, but I haven't tried it. You can double this recipe and use a 9 x 13-inch pan. Baking time will be slightly longer, 30 to 34 minutes. Preheat oven to 350 F. Line an 8 x 8 baking dish (I tend to use glass for this) with nonstick foil, leaving some hanging over 2 sides to form a "sling," which you'll use to lift the blondies out of the dish. You can also use parchment paper or well-greased regular foil. Of course you can also just grease the dish and cut the blondies directly out of the pan. In a large bowl, whisk together the flour, baking powder and salt; set aside. In another large bowl, beat the butter and brown sugar with a handheld electric mixer (this helps if your sugar is firm, but you can also do this with a whisk). If the mixture still feels hot to the touch, wait a few minutes before continuing. Beat in the egg, vanilla and rum. Stir flour mixture into the egg mixture. If batter feels warm, wait 5 minutes, then stir in the chocolate. Spread evenly in prepared dish and bake in the center of the oven for 26 to 30 minutes (30 to 34 for 9 x 13 pan), or until edges are puffed and pale golden. A skewer inserted in the center will be covered in moist crumbs, and the edges will be just able to pull away from the sides of the dish. Cool in pan 2 to 5 minutes, then grab the foil and lift the blondies out of the dish and transfer to a rack to cool completely. Again lifting foil, tranfer to a cutting board and slice as desired (I cut 12). These are still excellent the next day. After that, I freeze, them and they are perfect when defrosted at room temperature. yum, this recipe looks delicious! The recipe is simple. Will it be a good idea to use some chocolate syrup on top. Or will it provide too chocolaty taste. I just made these (except doubled the recipe so they would be thicker.) Amazing and crowd pleaser. The texture was amazing and like something you would get at a gourmet sweet shop! Thank you for sharing!